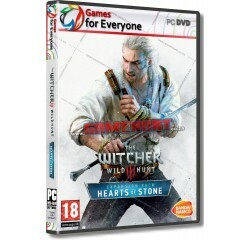 The Witcher 3 - Wild Hunt - Hearts of Stone 2in1 - 3 Disk - R250,00 : Game Hunt, Where we lead, others follow. Step again into the shoes of Geralt of Rivia, a professional monster slayer, this time hired to defeat a ruthless bandit captain, Olgierd von Everec, a man who possesses the power of immortality. This expansion to "The Witcher 3: Wild Hunt" packs over 10 hours of new adventures, introducing new characters, powerful monsters, unique romance and a brand new storyline shaped by your choices. Continue the journey of a professional monster slayer. Level up Geralt with more witcher work and acquire custom equipment! Face An Immortal Enemy. Hired by the Merchant of Mirrors, Geralt is tasked with overcoming Olgierd von Everec -- a ruthless bandit captain enchanted with the power of immortality.